Preheat oven to 400°. Place 2 mini muffin pans in the oven to heat. In medium mixing bowl whisk together flour, salt, pepper and parsley. In another medium bowl whisk together milk, eggs and melted butter. Pour wet ingredients into dry ingredients; gently combine with a whisk -- the batter will be thin and may have some small lumps in it. Tip: pouring batter into a squeeze bottle makes the job of filling the muffin tins quicker and more efficient. Carefully remove muffin tins from oven. Working quickly spray each pan with non-stick spray; fill each cup ¾ full with batter; top each with a small piece of blue cheese. Bake for 12-14 minutes until popovers are puffed and golden brown. Remove popovers from pans, wipe clean and repeat the process with remaining batter. 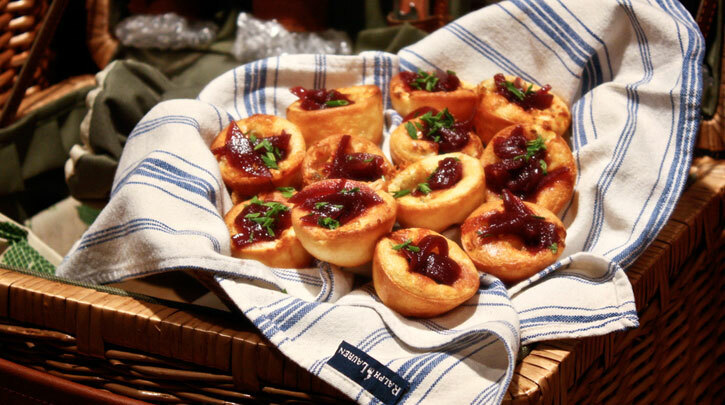 Top each popover with onion marmalade & serve. Popovers can be baked in advanced and gently reheated before serving. Heat a 9-10 inch heavy bottomed pan over medium heat. Add the oil and the onions. Cook until the onions are soft and translucent, stirring often. Do not let the onions brown. Add the red wine vinegar, reduce to almost dry. Add the Cabernet and the sugar, reduce to almost dry -- mixture should be thick and rich. Will keep for 2 weeks in the refrigerator.